Kumarin ja Cohnin vuodelle 2013 päivätty teos Telerehabilitation käsittelee ensimmäisten teosten joukossa myös videovälitteistä puheterapiaa. Teos on tilattavissa eBaysta vajaan 90 dollarin hintaan (lisäksi postikulut ulkomailta). Itse etäpuheterapiaa koskevien lukujen lisäksi teos käsittelee myös yleisemmällä tasolla videovälitteisesti toteutettua kuntoutusta ja sen suunnittelua, joten odotukseni teosta kohtaan ovat varsin korkealla. 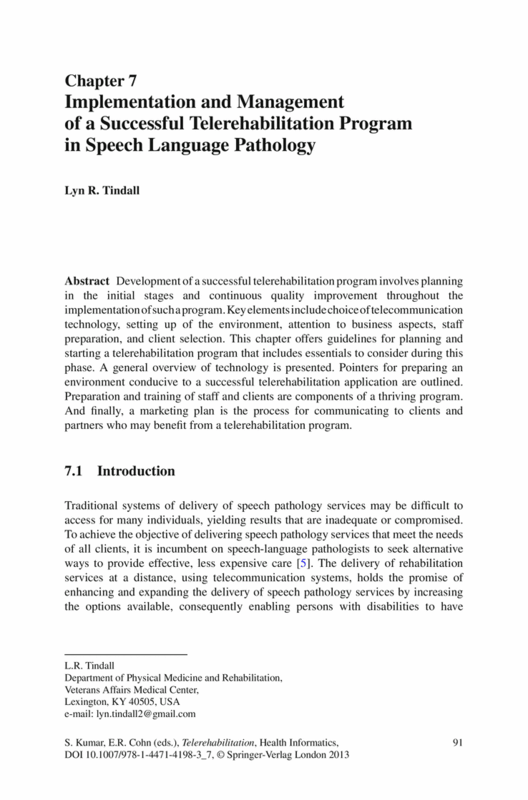 Koska Houstonin etäpuheterapiaa käsittelevä teos Telepractice in Speech-Language Pathology ilmestynee vasta vuoden 2013 tammi/huhtikuussa, on Kumarin ja Cohnin teos virallisesti ensimmäinen etäpuheterapiaa käsittelevä kirja. Tämä tuo mukavaa vaihtelua sille, että etäpuheterapiaa käsittelevä tieto on tähän asti täytynyt etsiä pääsääntöisesti alkuperäisartikkeleista tai ASHA:n dokumenteista. Ehkä etäpuheterapia alkaa hiljalleen olla muun muassa tämän teoksen ansiosta matkalla kohti valtavirtaistumista. 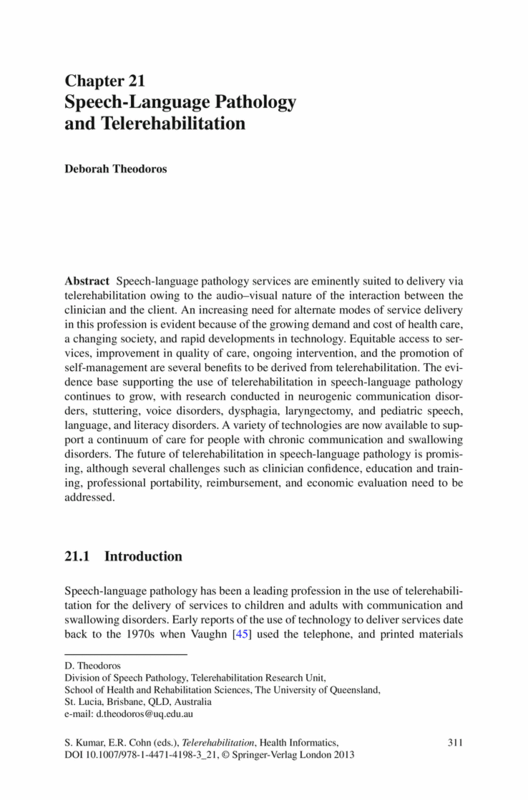 Speech-language pathology services are eminently suited to delivery via telerehabilitation owing to the audio–visual nature of the interaction between the clinician and the client. An increasing need for alternate modes of service delivery in this profession is evident because of the growing demand and cost of health care, a changing society, and rapid developments in technology. Equitable access to services, improvement in quality of care, ongoing intervention, and the promotion of self-management are several benefits to be derived from telerehabilitation. The evidence base supporting the use of telerehabilitation in speech-language pathology continues to grow, with research conducted in neurogenic communication disorders, stuttering, voice disorders, dysphagia, laryngectomy, and pediatric speech, language, and literacy disorders. A variety of technologies are now available to support a continuum of care for people with chronic communication and swallowing disorders. The future of telerehabilitation in speech-language pathology is promising, although several challenges such as clinician confidence, education and training, professional portability, reimbursement, and economic evaluation need to be addressed. For more than 30 years, speech therapy telepractice has been recognized as an effective substitute when no therapist was available. This chapter describes a speech therapy telepractice model that can provide treatment better than traditional methods and is not restricted to patients living in areas without qualified professionals. Using web-hosted applications, telepractice can be provided securely and effectively on virtually any computer, smart phone, or tablet at low cost to the therapist and no cost to the patient. 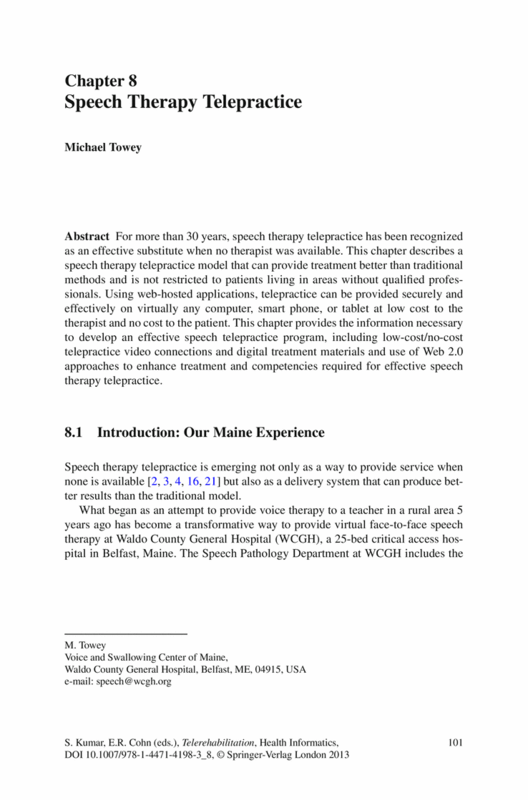 This chapter provides the information necessary to develop an effective speech telepractice program, including low-cost/no-cost telepractice video connections and digital treatment materials and use of Web 2.0 approaches to enhance treatment and competencies required for effective speech therapy telepractice. Development of a successful telerehabilitation program involves planning in the initial stages and continuous quality improvement throughout the implementation of such a program. Key elements include choice of telecommunication technology, setting up of the environment, attention to business aspects, staff preparation, and client selection. 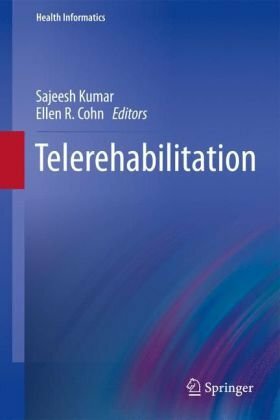 This chapter offers guidelines for planning and starting a telerehabilitation program that includes essentials to consider during this phase. A general overview of technology is presented. Pointers for preparing an environment conducive to a successful telerehabilitation application are outlined. Preparation and training of staff and clients are components of a thriving program. And finally, a marketing plan is the process for communicating to clients and partners who may benefit from a telerehabilitation program.